The Effect: The magician shows a full deck of cards to the audience. He then picks out a random ace from the deck. He places it on the table/ground. He then takes an "invisible" ace from the deck and puts that on top of the first ace. He then does the same; picks out an "invisible" ace from the deck, but this time he creates a seperate pile. He then gets the last "invisible" ace from the deck and puts it on the second pile. The Secret: You show the audience a deck of cards and pull out 2 aces (a double lift). You place them on the table/ground. Make sure the audience thinks there's only one. 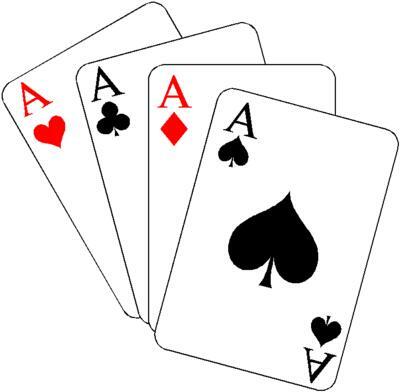 Then take an invisible ace (Nothing) from the deck and place it on top of the first card (When you place the "invisible" card down, all you are doing is revealing the second card.) You then take another 2 cards from the deck (double lift) and place them down as a new pile. You then do the same; take an "invisible card from the deck and place it down; revealing the last card.